Ospreys went three points clear at the top of the Guinness PRO12 League with a bonus point victory over injury-hit Connacht at the Liberty Stadium. The tries in the 29-7 success came from man of the match Dan Baker, Olly Cracknell and Nicky Smith, with Ashley Beck sealing the bonus point score in the final minute of the contest. Sam Davies kicked three conversions to take him passed 500 points for the region, but he was yellow-carded for a high and dangerous tackle late in the second half. Defending champions Connacht’s points came from a try from flanker Sean O’Brien, converted by John Cooney. Davies switched back to fly-half from full-back with Dan Biggar dropping to the bench. Connacht made three changes with scrum-half Cooney returning from injury to boost the back line, O’Brien coming in at blindside flanker and Naulia Dawai earning his first start. Connacht started brightly enough but were undone by Ospreys’ impressive overloading game as the home side scored two fine tries in the space of three minutes. The first try was started with a pinpoint flat pass from Davies which put Cracknell through a hole in midfield and after going through the phases Baker crashed over for Davies to convert. Ospreys’ great brand of rugby continued as a break down the right ended with Davies putting the in-form Cracknell over by the posts. Davies converted to make it 14-0 after 14 minutes. Despite Ospreys having real momentum, wing Matt Healy made a break up the left and a score was only prevented by a fine final-ditch tackle by Beck. On 29 minutes, more good attacking rugby by Ospreys saw Justin Tipuric go over in the right corner but when it was reviews by TMO Neil Paterson the score was ruled out for a knee in touch. Connacht were not helped that they lost both Jack Heenan and Jack Carty during the first half and were somewhat fortunate to be just 14-0 down at the break. Five minutes into the second half Ospreys extended their lead through a Davies penalty after a high tackle on Tom Habberfield by Tom McCartney. Connacht lost a line-out in the Ospreys 22 which proved costly as the home side worked their way up field, ending with prop Nicky Smith squeezing over for the third try. Davies converted. 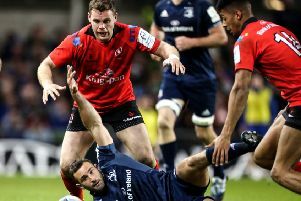 After Davies went to the sin bin on 69 minutes for a high tackle and the Irishmen showed character to hit back as O’Brien went over for a try down the right after picking up a loose ball. With time running out 14-men Ospreys went on one last desperate attack in search of the bonus point which came when Beck slid over in the left corner. Biggar missed the conversion.